The widow and mother of Eric Garner, the New York man who died after he was put in a chokehold by police, on Sunday denounced the ambush killing of two police officers the day before. 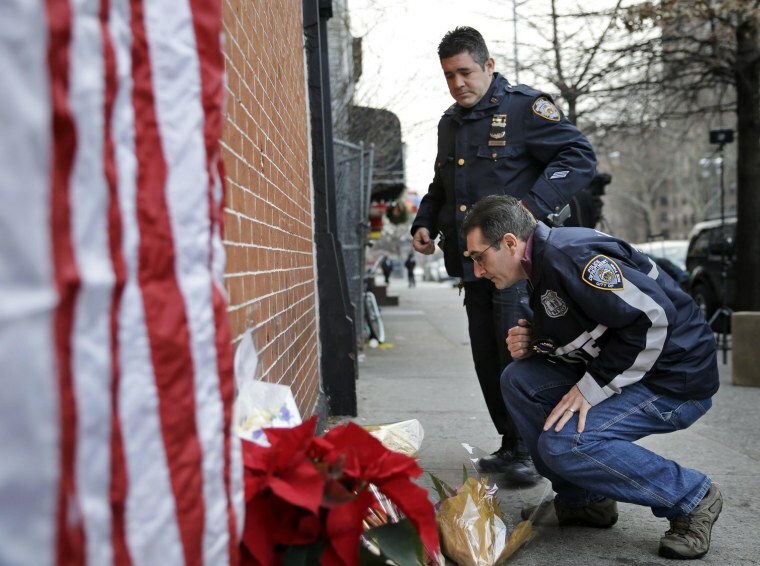 The officers, Wenjian Liu and Rafael Ramos, were shot Saturday while sitting in their squad car. Investigators are examining social media posts by the gunman, Ismaaiyl Brinsley, suggesting that the killings were retaliation for the deaths of Garner and of Michael Brown in Ferguson, Missouri. Protesters have marched in cities across the country since grand juries declined to indict the officer in the confrontation with Garner and the officer who shot Brown to death. Garner’s widow, Esaw, asked on Sunday that future protests remain peaceful. “My husband was not a violent man,” she said. “We don’t want violence connected to his name.” She also expressed empathy for the families of the officers. “I know what they’re going through to lose a loved one right before the holidays,” she said. President Barack Obama called Bratton and “reiterated his call for the American people to reject violence and words that harm, and turn to words that heal — prayer, patient dialogue and sympathy for the friends and family of the fallen,” said Eric Schultz, a White House spokesman. Mayor Bill de Blasio, seeking to calm tensions, attended Mass at St. Patrick’s Cathedral. The head of the police union suggested on Saturday night that de Blasio shared blame for the officers’ deaths, and some officers turned their backs to de Blasio when he appeared at a press conference. The Rev. Al Sharpton, the president of National Action Network and a host on MSNBC, said on Sunday that blame for the officers’ killings was being “misguided” to protesters and to de Blasio.